Email is one of the most critical applications in use in business today: it is embedded in many business workflows, it is used by engineers to inform them of infrastructure issues and it is used to communicate with customers and business partners. In short, the modern organization has email at the heart of its communications and business processes. 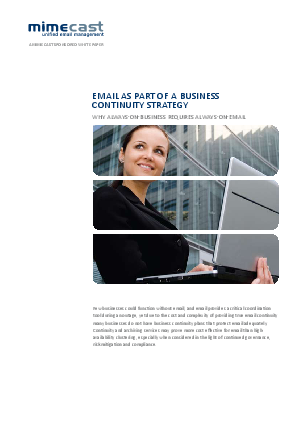 This makes it critical to minimize both the downtime and loss of email upon the outset of a business continuity event. Maintaining email is no longer about keeping just the mail server itself online, organizations now employ email infrastructures containing multiple products to mitigate the risk of malware, spam, litigation and non-compliance. Maintaining access to email while upholding risk mitigation and compliance is a challenging endeavor, this white paper discusses the issues involved with addressing this problem.